We are happy to be able to announce our next model-novelty, the CMC Ferrari D50, 1956. Further, limited versions will follow still in 2018. Each model does have its own, unique story. Please take your time to enjoy the descriptions of the different models. But don’t hesitate too long, because for example the model M-183 CMC Ferrari GP Italy(Monza) 1956, J.M. Fangio / Peter Collins, Limited Edition 1000 pcs. is already sold out thru pre-orders. In addition to financial problems, the tragic death of Alberto Ascari shortly after the 1955 Monaco GP eventually put an end to the ambitious D50 project of Scuderia Lancia. It dashed Giani Lancia’s last hopes to stay in Formula 1 racing, not to mention his old dream of taking the lead. 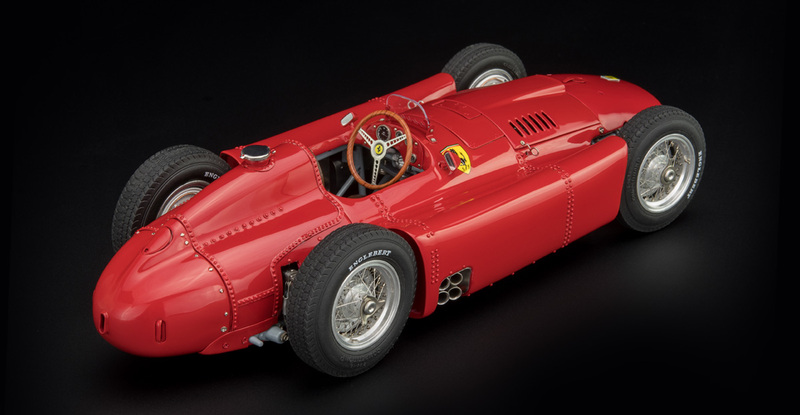 On July 26, 1955, the Lancia D50 fleet, together with its blue prints and documents, tools and a lot of parts, was turned over to the previous competitor Ferrari. This was an exceptional stroke of luck for Enzo Ferrari, as Scuderia Ferrari suddenly acquired a powerful means of racing that had more than demonstrated its worth from 1954 onwards. Furthermore, the former chief designer of the Lancia D50, Viktorio Jano, also joined Scuderia Ferrari. The two side tanks, each positioned between the front and rear wheels and mounted independently of the body torso, are replaced by a single tank in the rear of the vehicle, behind the driver’s seat. The space that used to be occupied by two side tanks is now covered under the side panels of torso bodywork that assume the shape of a curvious surface on each lateral side. Also under the cover of the bodywork are the exhaust pipes — four on each side, which are bundled and made to protrude out of an opening before the rear wheel on each side. They help generate the deafening roars that are typical of a Ferrari. Maxium engine output is increased to a whopping 265 horsepower, and adjustment is allowed in connection with cylinder heads, valve timing, and pistons, etc. The two external oil coolers beside the cockpit are gone and replaced by a tube oil cooler installed in the front of the radiator. The oil tank at the very end of the tail is retained in the same place. Last but not the least, minor changes are made to the spaceframe and wheel suspensions (e.g. the transverse leaf spring on the rear axle moved upwards). The tires are switched to the Englebert brand. Consequently, a new D50 was born. M-180 introduces a standard replica of this new D50 with a short nose. A different version of the new D50 will be introduced with a long nose, such as the one racing in the GP of Germany 1956 at the Nürburgring. After Mercedes withdrew from racing at the end of 1955, Juan Manuel Fangio had to look for a new job. Ferrari welcomed him with open arms. By recruiting several more well-known drivers, including Luigi Musso and Eugenio Castellotti from Italy and Peter Collins from England, Scuderia Ferrari formed a top-notch team to race its new D50s in the 1956 Grand Prix season. 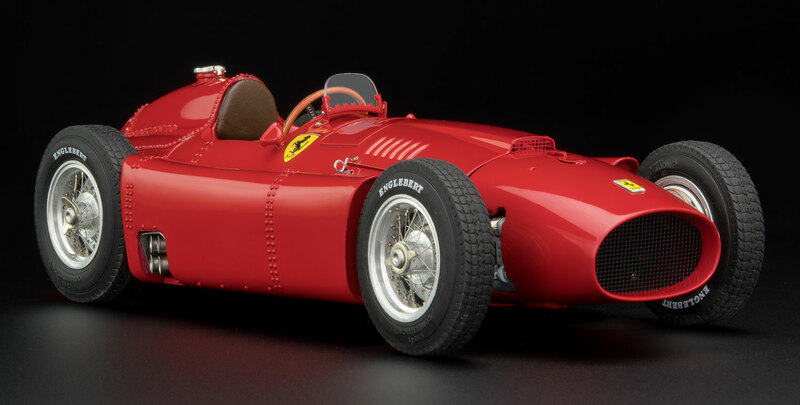 Altogether Ferrari won five Grand Prix victories in 1956, and by the end of the GP season, Juan Manuel Fangio, who had scored the most points in a Ferrari D50, clinched his fourth World Championship of Drivers. This special edition consists of the following three winning racing cars, each with Fangio at the wheel in 1956. Background information can be found in the individual model descriptions. Additionally this model-set will be delivered including a display case and a driver figurine. This special edition consists of the following three winning racing cars, each with Collins at the wheel in 1956.